Just so everyone knows, this could turn into an incredibly large post :). First, the last two days of Secret Santa. Thursday I received another Dr. Pepper and a cute snowman sponge. Friday at our Christmas lunch at Alexander's Steak House, I learned that my old office mate, Julie, was my Secret Santa. Friday I received a gift card to Target. Today I declared a self-proclaimed snow day. I got to work at 9:40 (after a dentist appointment). I had a message from my 11:45 client that he was not at school because he was home sick. When it started snowing at 10:00, I called my afternoon client in Washburn to tell the grandma I would not be coming out. So, since I did not have any clients I decided it was silly to stay at work while the roads got bad. So, I got home at 11:30. It was a blessing though because I was extremely productive! I did a load of laundry, then washed my sheets. I cleaned my bathroom and dusted my bedroom. I finished a book. I took out the trash. I made my bed, put my clothes away. I did an hour of paperwork (so really I worked until 12:30!). 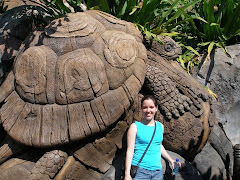 Then I got unproductive and have been working on this blog for over an hour! 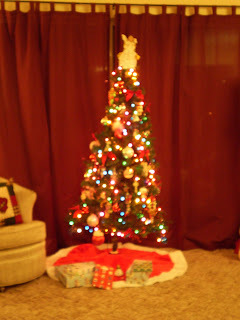 Here are a couple pictures of our Christmas tree. If it looks like the tree is leaning it is just a figment of your imagination! Promise! Here's a picture from today with the snow in the background. And all the presents under the tree. Emily was laughing at me because I had so much fun organizing them. This is the first time in probably 6 or 7 years that I have had my own tree (well, really my mom's tree, but let's not get so picky). 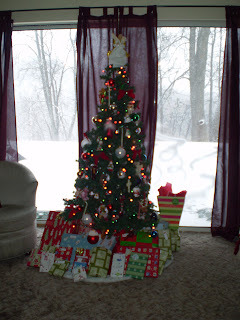 When I was living at home it was always my job to arrange the presents under the tree. I guess I have been able to do that at Dad's house too, but the first time at my own place! 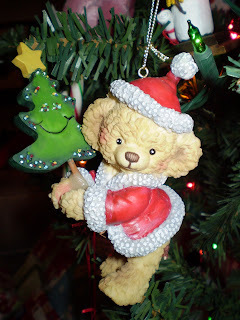 1994 ornament. 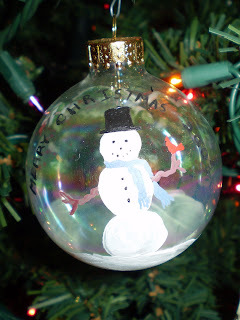 I think this was the first year mom did ornaments. The reason I say "think" is because when I was getting my ornaments from mom earlier this year we found one that was broken. 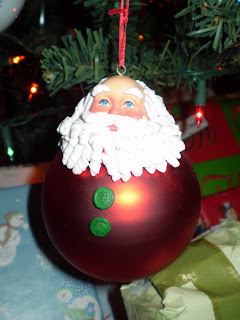 It was either my first or second ornament, but I think it was the second. 1996. My brother got a similar one that looked like a snowman. 1997. I love this one because it's pretty unique. 1998. I received a similar one in 1999. They were made by a local artist in our hometown in Georgia and mom thought they were really cool. 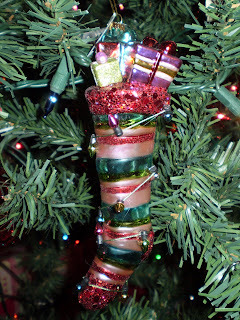 The other one says "The greatest gift ever given was given on a tree." 2002. 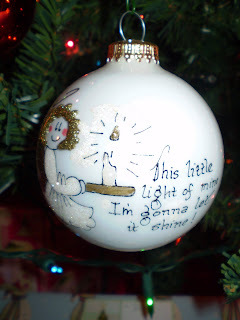 This is one of several "inside out" ornaments that I received over the years. I found these at a craft store in my college town one year and bought the first one for my mom. 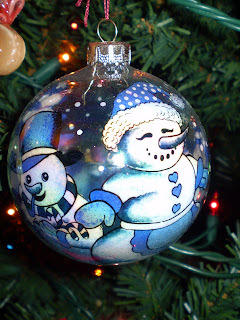 The ornaments are actually painted from the inside! After that, we loved them so much that we bought/received them for several years. This one is either from 2004 or 2005. I didn't want to pull boxes out to figure it out :). I actually received two ornaments this year in the same series. The other one is a bear dressed like an angel blowing a trumpet. 2006. This year mom went "whimsical." 2007. These three are last year's ornament. I'm guessing mom couldn't decide which one she liked best, so she bought all three! But I really like them, so I didn't complain! 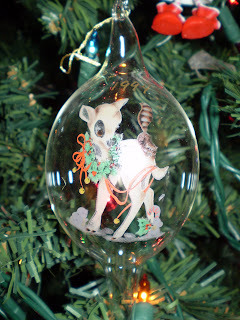 Here is miscellaneous ornament #1. My friend Danell actually painted this for me in 2003. 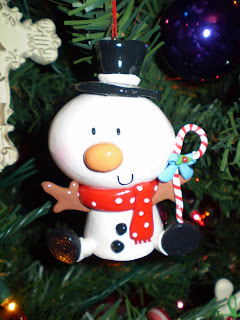 You can't tell from the picture, but on the other side of the ornament is a bunch of trees, so if you're looking at the snowman it looks like he is built by a forest. Very cool. She's way more artistic than me! 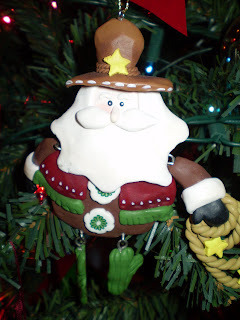 Sheriff Santa! I love that his legs are dangling cacti! 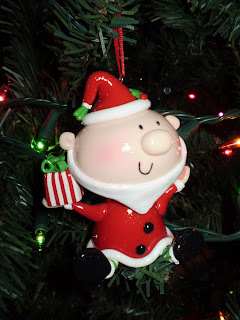 So, now you know about half of the ornaments that are hanging on my tree. I realized that this season is so hectic that only Emily and I are actually going to see the apartment decorated, so I wanted to be able to share my decorations with everyone! Oh my goodness!!! The memories it brings back! 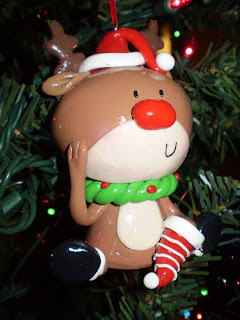 I put up my tree but realize, I don't have anyone to play I'm thinking of an ornament with! 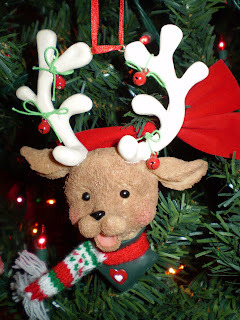 Love the post---Merry Christmas to everyone! 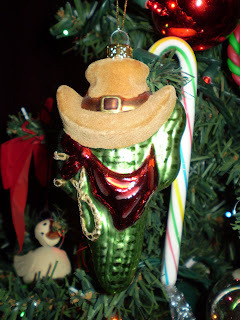 Did we take pictures of all of your ornaments??? Very very cute! My tree is pretty too!